Apple hasn’t had a flagship Macintosh lately; each model has had its area of specialization. The Mac Pros have always been the fastest, but they have a very limited appeal. The MacBooks are the most popular. The MacBook Pro laptops are probably the ones to be seen with when out and about. All of that just fell by the wayside, as the new 27-inch iMac now is the “Mac to have”. The iMacs have always been nice home machines for doing Web browsing, writing, movie watching and light/consumer multimedia work. They look great in artists’ studios and designers’ homes and are at home in school labs. But they’ve never been “high end” for technophiles. That’s not to say they don’t work well in an office environment. We moved about half of the artists (ie, Adobe jockeys) in my last office from Mac Pros to high end iMacs, and with much success. Sure, they have the ultra-shiny screens and they aren’t terribly upgradable, but a maxed-out iMac performs just as well as a medium level Mac Pro — which is plenty for most Adobe/light video editing creative types. Still, money not being an object, my dream machine would have been a Mac Pro with a 30-inch Cinema Display (or two). As of yesterday, that is no longer the case. The 27-inch iMac has all of the horsepower that I will need for the foreseeable future. The high-end Quad Core i7 Intel configuration with 16GB of RAM and ATI Radeon HD 4850 graphics processor on that gorgeous 27-inch screen is as solid a computer as I can imagine. It also has most of the pixel screen area of a 30-inch display (2560×1440 for iMac vs. 2560×1600 for 30-inch SXGA) yet is smaller than a 30-inch display. Oh, and you get a freakishly fast computer in there as well. In fact, the base model 27-inch iMac is $100 less than an Apple 30-inch cinema display. But is the computer inside that giant display any good? It is fast, indeed. 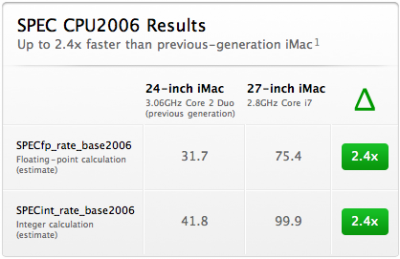 More than double the speed of the previous iMacs. I’d wager that Apple’s Enterprise group doesn’t want you to see how it performs against Mac Pros. It likely compares pretty favorably with low- to mid-range models for 99% of what people use these things for. If you spend your day doing Maya rendering or protein folding, you’re obviously stuck with a Mac Pro. For expansion, the video card options are both fast and powerful. You can even add an additional 30-inch display to your iMac via the Mini DisplayPort-out. You can also use it as a monitor for the DisplayPort-in — though I am not sure why you’d need to. You’ll also be forced to add Firewire or NAS hard drives rather than internal drives if you want to go beyond the 2TB max size. eSATA would have been nice, but I think Apple’s next interface will be Intel’s 10 GB LightPeak. Okay, they might have taken it a bit far, but the point is clear. This is not only a spectacularly performing machine that is loaded to the teeth with features, it is also the best looking computer out there. Period.